The Queen and the Royal Family cost the UK taxpayer £37.4m in the last financial year, her financial public accounts reveal. The cost, equivalent to 62p per person in the UK, rose 4.2% over the previous year, accountants said. The increase was partly blamed on extra security vetting undertaken at Buckingham Palace. It followed a national newspaper exposure when a reporter obtained a job as a footman there. Freedom of information inquiries and the cost of a number of long-haul overseas visits by members of the Royal Family, also contributed to the rise. Travel costs increased by 10% to £5.5 million. During the year, the Royal Family made 14 journeys on the royal train compared to 19 in 2004-05. In total, 48 journeys were made by scheduled rail services. Among the journeys detailed in the financial report was a £44,885 "reconnaissance" trip by staff from Clarence House for the Prince of Wales's visit to the US. A similar trip by Buckingham Palace staff to Australia and Singapore ahead of the Queen's official visit cost £15,085. A senior Palace aide said the difference was because of the "complicated" nature of Charles's trip. "As far as the Prince of Wales's trip was concerned, it was a very complicated trip. There were a lot of different interests related to the engagement he was carrying out," he said. Keeper of the Privy Purse Alan Reid said the Queen and the rest of the Royal Family were good value. "Given this is a World Cup year, 62p would buy you a ticket for one minute of England's game against Portugal on Saturday," he said. "If we're going to maintain historic buildings that we're responsible for, we will need more money. We will putting more pressure on the Department for Culture, Media and Sport," he said. The household receives £15 million from public funds annually for running the palaces. But senior officials said the figure was set in 1998 and is only reviewed every three years. They said they would be asking for £1 million more, plus inflation. 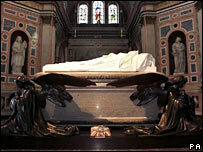 The mausoleum at Frogmore, Windsor, was said to be the site most in need of restoration, amounting to £2 million. "There was also asbestos which needs clearing all over and a two-acre lead roof at Windsor Castle which we've been patching that needs work," a senior aide said. The quadrangle at Buckingham Palace needed to be "cleared up" and the Picture Gallery roof needed to be replaced, he added. Following the publishing of the Queen's accounts, a small number of campaigners from the pressure group Republic protested outside Buckingham Palace. They included agony aunt Claire Rayner and human rights activist Peter Tatchell, who called for greater transparency over the Queen's income and taxation. "The mysteries of the royal finances are symptomatic of the monarchy's lack of openness and accountability," he said. 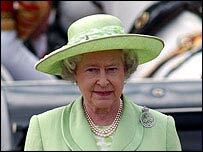 "The Queen's personal wealth is shrouded in secrecy. There is little disclosure. "We don't know how much she is worth and on how much of her wealth she pays tax." The Queen's accounts come two days after Clarence House revealed Prince Charles paid nearly £3.3m in tax in 2005 - some 23% of his income of more than £14m. Accounts also show his private income rose by 6% to more than £14m in 2005-06 on the back of commercial property rent reviews and higher investment returns.